Arab-Norman bronze pail (c. 1100-1200) from the Contrada Bambina shipwreck near Marsala. 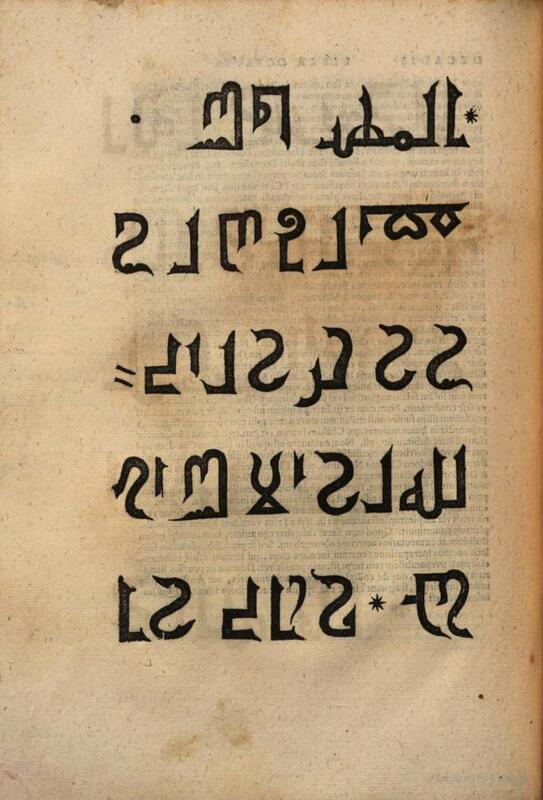 Beneath the rim, a punched inscription from the Qur'an in early Arabic characters. This pail was part of the exhibition Storms, War and Shipwrecks: Treasures from the Sicilian Seas (Ashmolean Museum, Oxford, 21 Jun 2016 to 25 Sep 2016), but is owned by Museo archeologico regionale Lilibeo-Baglio Anselmi, Marsala. Muqarnas is a very common element of Islamic Architecture. It is a form of ornamented vaulting, the geometric subdivision of a squinch, or cupola, or corbel, into a large number of miniature squinches, producing a sort of cellular structure, sometimes also called a "honeycomb" vault. Muqarnas developed around the middle of the 10th century in northeastern Iran and almost simultaneously — but apparently independently — in North Africa. Examples can be found across Morocco and by extension, the Alhambra in Granada, Spain, the Abbasid Palace in Baghdad, Iraq, and the mausoleum of Sultan Qaitbay, Cairo, Egypt. Large rectangular roofs in wood with muqarnas-style decoration adorn the 12th century Cappella Palatina in Palermo, Sicily, and other important buildings in Norman Sicily. Muqarnas may be made of brick, stone, stucco, or wood, and clad with tiles or plaster. The individual cells may be called alveoles. The muqarnas in the ceiling structure of the Norman Chiesa della Santissima Trinità alla Zisa (aka Cappella palatina della Zisa) - the little chapel next to la Zisa. 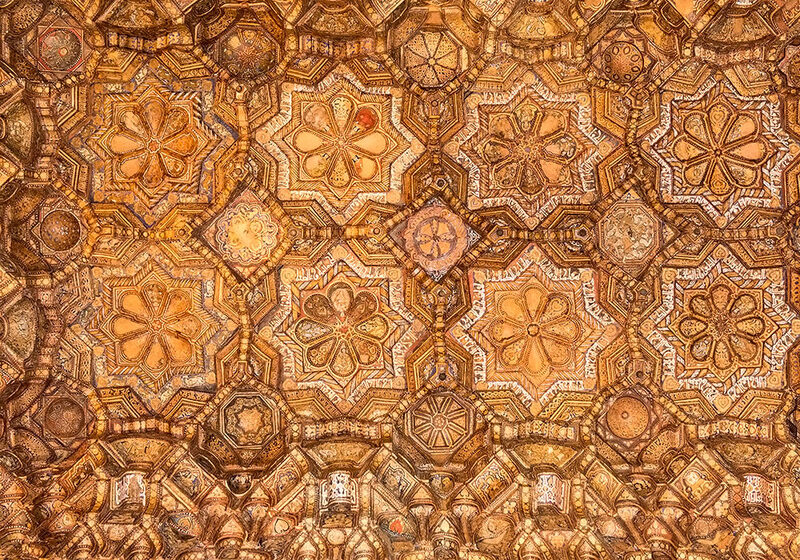 The spectacular wooden muqarnas in the ceiling at Cappella Palatina. The remains of a hall with stalactite vaults and reliefs at La Cuba. 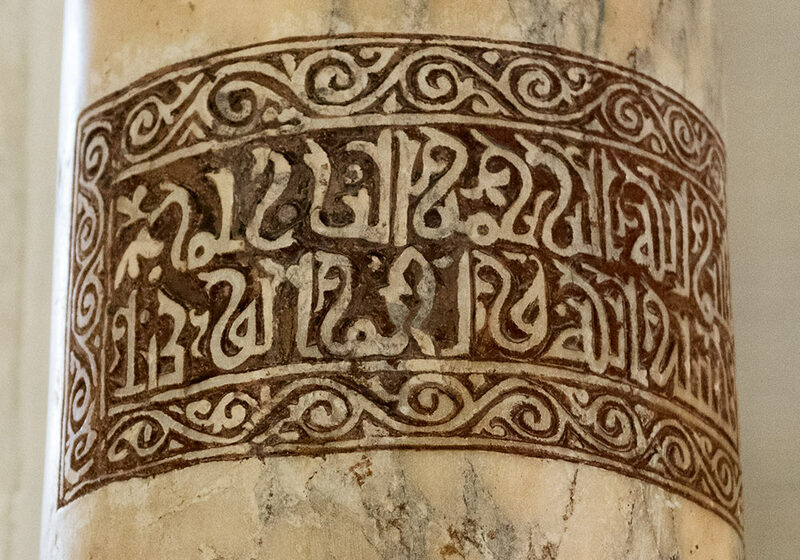 Islamic inscription on a column in La Martorana (Santa Maria dell'Ammiraglio), Palermo. Jeremy Johns states that these columns in all probability were originally employed in the porticoes of the forecourt, flanking the western entrance, and corresponding to the two dedicatory mosaic panels within. That which alludes to George bears two bands of inscription: the collar beneath the capital reads “Truly, God is with those who fear Him”, Qur'an 6: 128; and a panel in the middle of the shaft is inscribed with the hasbala, the motto introduced as an apprecatio in the Arabic documents of the royal diwan under the viziership of George of Antioch – “In the name of God, the Merciful, the Compassionate, God is sufficient for me and He is the best advocate”. 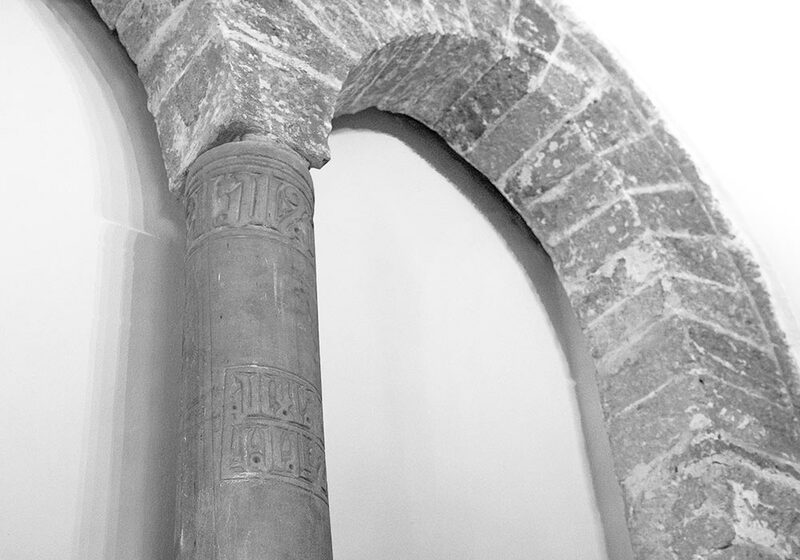 The explicitly Islamic tenor of these inscriptions suggest that this column was probably spolium from a religious building, and was reused in Santa Maria because of the close association between the hasbala and the vizier George. The second column is inscribed with four ad'iya (sorry, the correct letters not available) from the standard royal repertoire used by king Roger, and was presumably carved ex novo to provide a counterpart to the first inscribed column. Based on Jeremy Johns' article "The Arabic inscriptions of the Norman kings of Sicily: a reinterpretation". I am responsible for all errors. 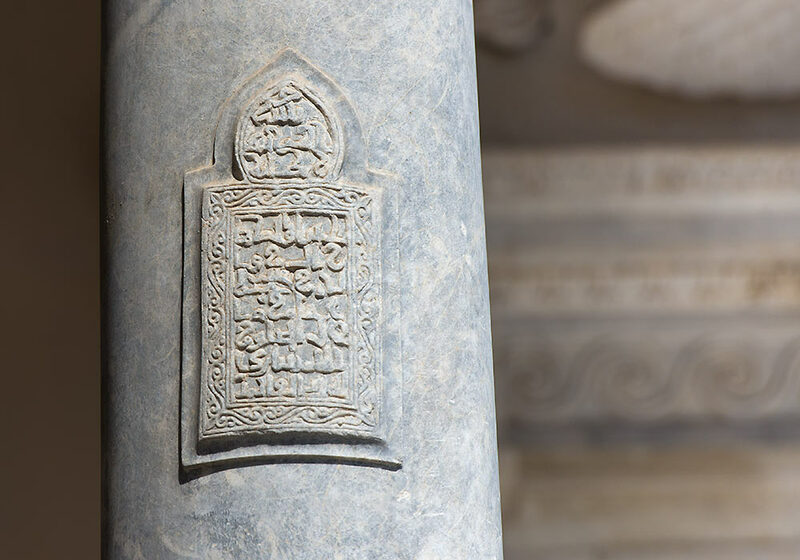 Islamic inscription on the left column outside the cathedral of Palermo may have been preserved from the earlier mosque. The passage is from the Koran. 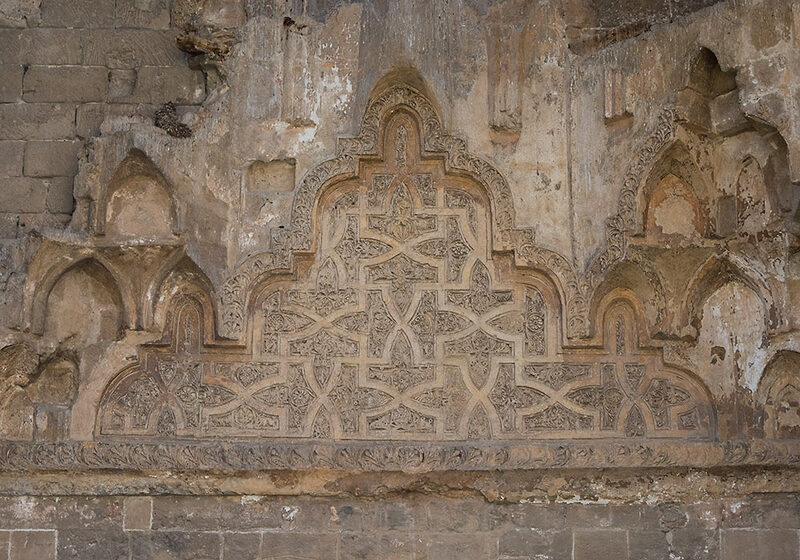 Islamic inscription in La Magione, Palermo. The remains of a mosque are located in the immediate vicinity of the ancient theatre of Segesta, outside the fortified area of the late medieval settlement. It is laid out over an irregular rectangle 20.5 m long and 11.4 m wide, and was constructed in a single phase using a uniform building technique (limestone blocks bound with mud). The floor is bare rock. The mihrab niche on the south side, correctly oriented to within a few degrees of southeast, is 2 m wide on the inside and 1.5 m deep. It is rectangular on the outside and protrudes from the wall by about a metre. There are no traces of a minbar. It was probably a rural mosque from Norman times, which was built, along with the fortified settlement, on high ground by an Islamicised people fleeing the lands gradually being conquered by the Normans. It is not clear whether it served just the village or the entire surrounding area. An Islamic necropolis has been discovered nearby. The mosque was dated from the discovery during excavations of ceramic remains dating back to the 12th century. 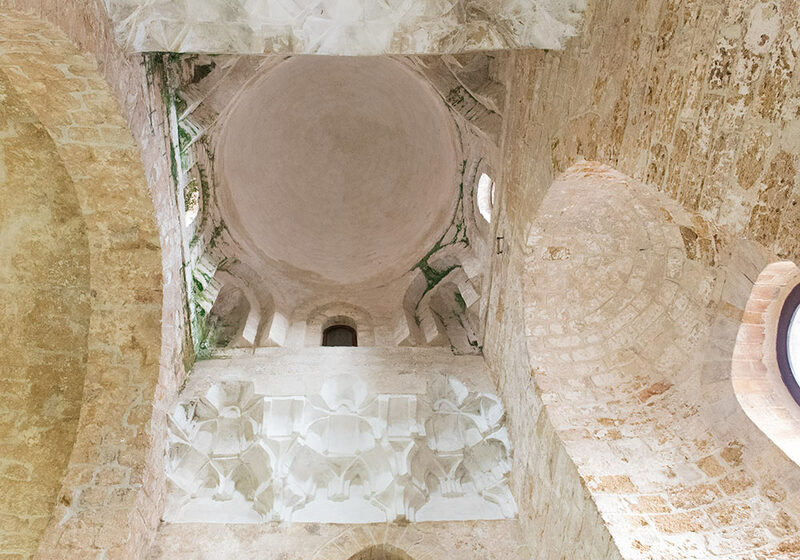 In this video Jean Paul Barreaud examines Castello Poggiodiana, a military castle built on a well by the pre-Norman Muslims of Sicily. It is situated outside Ribera between Sciacca and Agrigento. Roger I later gave it to his daughter. 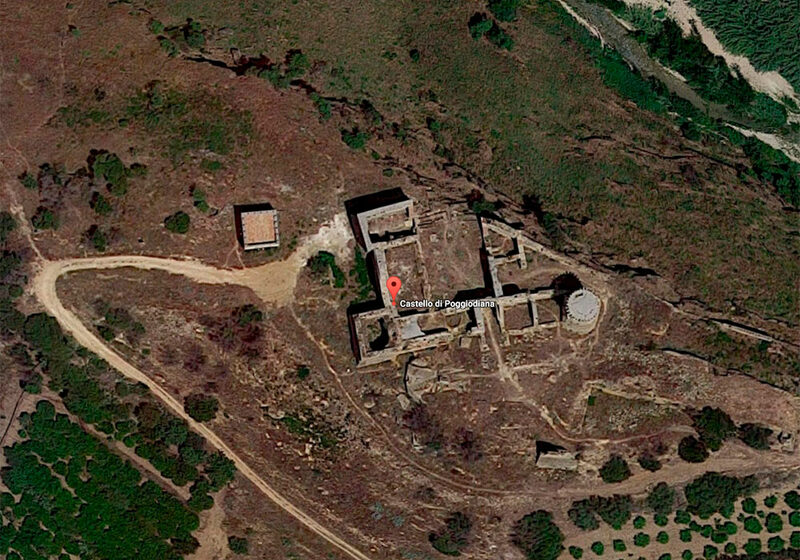 Castello di Poggiodiana (Google Satellite View). View the castle and its surroundings on Google Earth (requires Chrome). Caltagirone derives from the Arabic "qal'at-al-jarar" ("Castle of [pottery] jars"). Caltagirone is famous for its pottery production. The city was almost completely destroyed by the earthquake of 1693. 'Gibilmanna' derives from Arabic 'gebel' (mountain) and 'manna' (edible substance extracted from the manna ash trees). Misilmeri (Menzel al Emir). Sicilian: Musulumeli. Alcamo: manzil al-qamah, perhaps meaning the ‘farm of bitter cucumbers’. 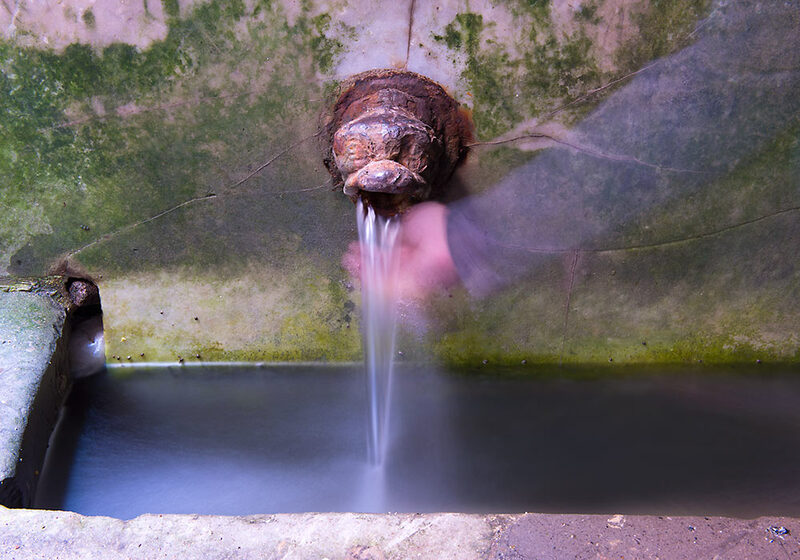 During the Arab period (827–1072) in Sicily, Palermo was equipped with a huge water supply system (qanat/kanat). 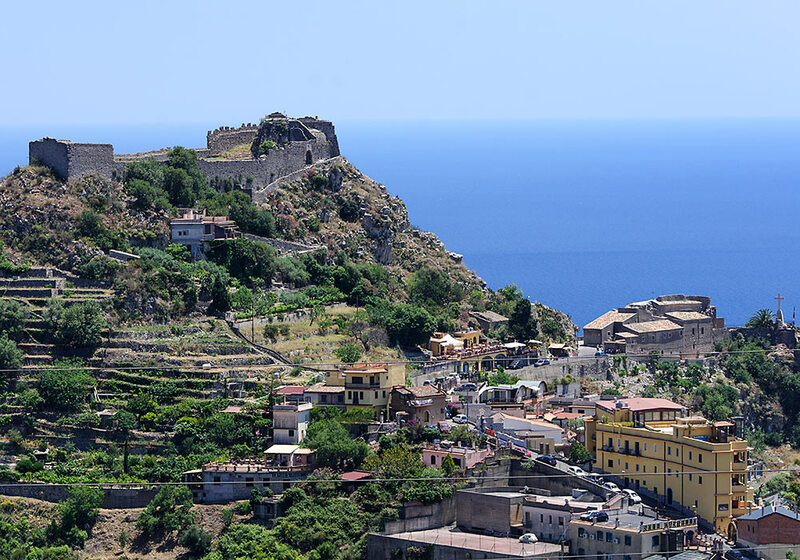 The Saracen castle seen from the way down from Castelmola to Taormina. The Saracens (Muslims) lost Taormina to the Normans in 1079. 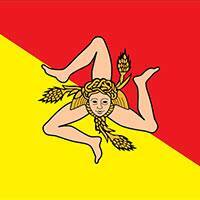 About 80 percent of the population in Sicily were Muslims, so relative religious harmony was essential for the Normans. Roger I's concern for the Muslims was not simply a matter of policy, Gordon S. Brown argues, "but also one of respect. He found that he had assumed rule of a state with a rich and inventive culture and tradition, one that could, in the proper circumstances, flourish side by side with Latin and even Greek traditions to the mutual benefit of all." Ibn Hamdis (c. 1056 – c. 1133) was a Sicilian Arab poet, born in Noto, Sicily. The Lavatoio is a picturesque medieval wash-house made during the Arab occupation of Sicily (827-1090). 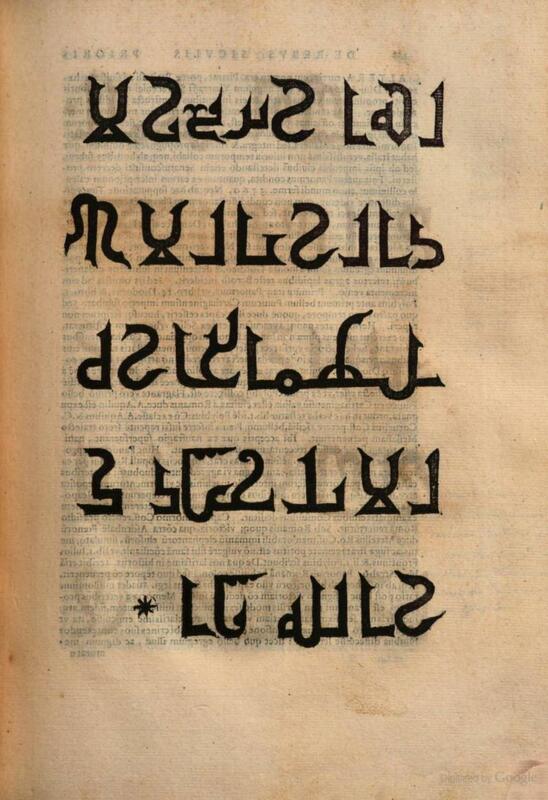 Arabic letters in Tommaso Fazello's History of Sicily De rebus Siculis decades duae (Palermo, 1558).